The original source cited by the Old Foodie, as I mentioned yesterday, is apparently a 1937 American newspaper article, though I don’t know which newspaper. I have not been able to find it. The earliest Malted Milk Cake recipe I’ve been able to find is here, but though the book is claimed to be a reprint of a 1900 version of A Book of Practical Recipes for the Housewife, it’s not likely to be that old. 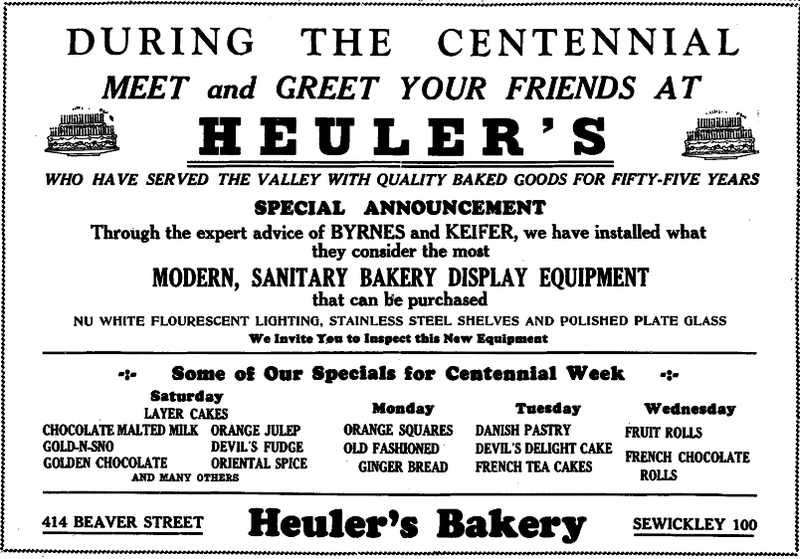 The “Frozen Cookies” recipe on page 63 refers to a “mechanical refrigerator,” which wouldn’t have been available for household use in 1900. There are versions of this cookbook elsewhere online that are dated in the 1920s and 1930s, such as this one dated 1923. For this experiment, I’ll stick with the Old Foodie’s recipe, but maybe I’ll try the Practical Recipe version another time. The only change I made to the 1937 recipe was slightly increasing the amount of vanilla. I mixed the cake batter, and I must say, it was really, really good. (I know I’m not supposed to taste cake batter with raw eggs! But it’s so good!) It was a lovely light brown color and had a gentle chocolate malt flavor. The cakes baked beautifully. I had to cook them an extra 10 minutes, but my oven temperature often runs a bit low so this wasn’t surprising. The kitchen smelled wonderful. So far, the recipe looked like a success. Then came the Chocolate Malted Milk Topping. 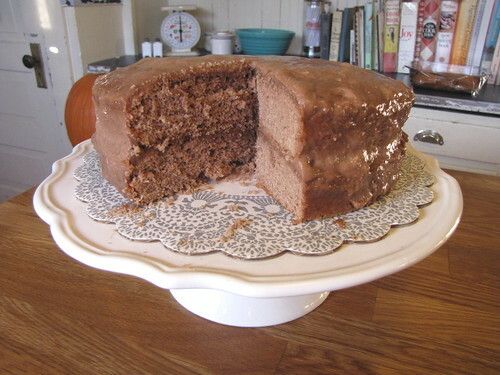 T. W. Barritt at the Culinary Types blog has also made this recipe, and said about the topping in 1920s slang, “The icing is just a bit ornery and doesn’t hit on all sixes.” I agree. The gelatin/evaporated milk/malted milk/sugar combo whips into what looks like a really nice, smooth icing, but it’s definitely ornery, as well as not quite as much as I would have liked to cover the cake. 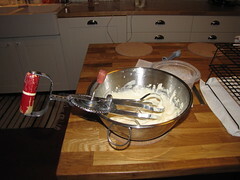 I even used an old egg beater to whip up the icing. Much quieter than an electric mixer. When whipped—with an old-fashioned non-electric egg beater, since I didn’t want to wake a sleeping housemate—the icing is smooth and glossy and liquidy. But it nearly immediately sets back up into something gloppy. It is chilled gelatin, after all. It is very difficult to spread it nicely once it does this. In retrospect, I wonder if pouring it over the top of the cake immediately after whipping it to a smooth liquid state would have worked better. Once assembled, though, the cake looked reasonably nice, as you can see in the photo. I put in in the ol’ ice box (well, “mechanical refrigerator”) to chill. The cake itself is wonderful. It is light, and not too sweet, with a malted chocolate flavor that doesn’t overpower you. It doesn’t taste like a Whopper, for example, which is all overwhelming sweetness and waxy “mockolate.” It’s just got a well-balanced malted milk flavor. I would make the cake again, any time. The icing is another story. It wasn’t just that it was kind of annoying to work with. I can live with that. But the gelatin was also problematic for textural and flavor reasons. The topping seemed just a little too stiff and rubbery once it set up, and I could taste just the tiniest taste of plain gelatin behind the sugar, malt, and milk flavors. It’s weird—I don’t notice that taste if I have, say, flavored Jell-O. But I definitely taste it here, and that touch of gelatin flavor puts me off the topping just a bit. Considering the results of the earlier Tomato Jelly Salad experiment, I’m beginning to think that I just have a problem with gelatin in general. It’s a good thing I didn’t grow up in the 1920s or 30s. Kristen and Jason were also guinea pigs for this recipe. Jason liked it, but thought the cake was slightly dry. He didn’t notice the issues with the icing that I did. Kristen liked the cake, but, like me, did not care for the icing. Despite the icing not being to my taste, the cake overall is a success. Next time, different icing: something light, to match the lightness of the cake, and without gelatin. Last week I made a lemon ice box cake that had frosting made from whipped cream, sweetened condensed milk, and lemon juice. It was light and delicious. I wonder how something like that, with malt and chocolate substituted for the lemon, would work with this cake. Long time readers may recall that the main inspiration for this blog was my search for the “Gold-n-Sno” cake mentioned in Finding Betty Crocker: The Secret Life of America’s First Lady of Food. The Gold-N-Sno cake seems to have been a cake that was mostly made by bakeries, not by home bakers. 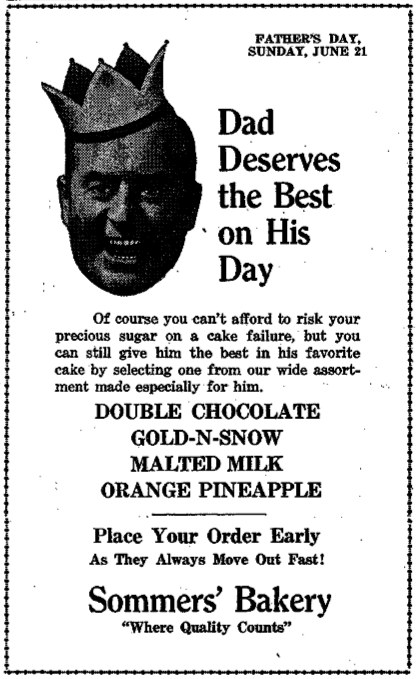 When bakeries advertised the Gold-N-Sno cake, they frequently listed another cake that caught my eye as well… a Malted Milk Cake. I love the flavor of chocolate malted milk. Chocolate malts, Maltesers (Whoppers may substitute in a pinch, but Maltesers are so much better), whatever. I love it. And it’s a flavor that can be hard to find sometimes. 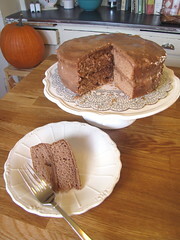 I went looking for a malted milk cake recipe, and soon found a recipe at The Old Foodie, who says it’s from an American newspaper article in 1937. Light oven and set at moderate (350F) temperature. Grease and flour two 9 inch cake pans. Sift before measuring the cake flour and re-sift with the chocolate malted milk, baking powder and salt. Cream together until light and fluffy the shortening and sugar. Beat in vigorously the egg and vanilla. Soak the gelatin in the cold water for five minutes. Scald [the evaporated milk] over boiling water. Add soaked gelatin and stir until dissolved. Pour into bowl or freezing tray of mechanical refrigerator and chill until icy cold. Whip until stiff with rotary beater or electric mixer at high speed. Fold in the malted milk and sugar. Spread between and on top of cake. Chill. No problem. I figured I’d just run down to the store and get some chocolate malted milk. Oops. That was harder than expected. Sometime in the last few years, most, if not all, of the grocery stores in Seattle that used to carry chocolate malted milk powder have stopped. Most of them still have the plain malted milk, but not the chocolate. The only store that carried it, as far as I could find, was the Amazon Fresh delivery service—but they didn’t serve our area at the time. My friend Amie stepped in with an offer to order the malted milk from Amazon Fresh for me. With the chocolate malted milk finally at hand, I would have made the cake. By then, however, my kitchen was in a thousand pieces and in no condition for cake baking. So here we are, nearly a year later, and the time has finally come for the malted milk cake. 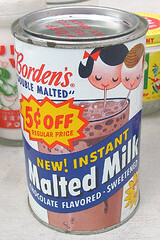 (And since then, Amazon Fresh has stopped carrying the malted milk as well! Good thing I saved it for this cake.) Stay tuned for the results of this experiment.